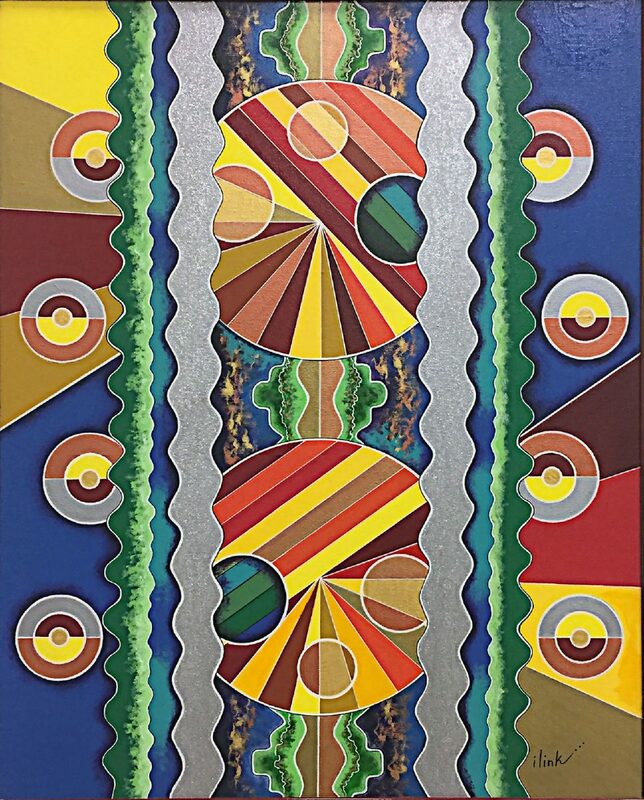 “Elements and Principles,” on display at the Kika de la Garza Fine Arts Center, rejoices in the basic art elements. Artist Isabel Link embraces her dual roles as artist and art teacher with this color-saturated body of work in colored pencil, acrylics and mixed media by creating a joyous exhibition. The works are numerous and show different aspects of her relationships with colored pencils and acrylics. 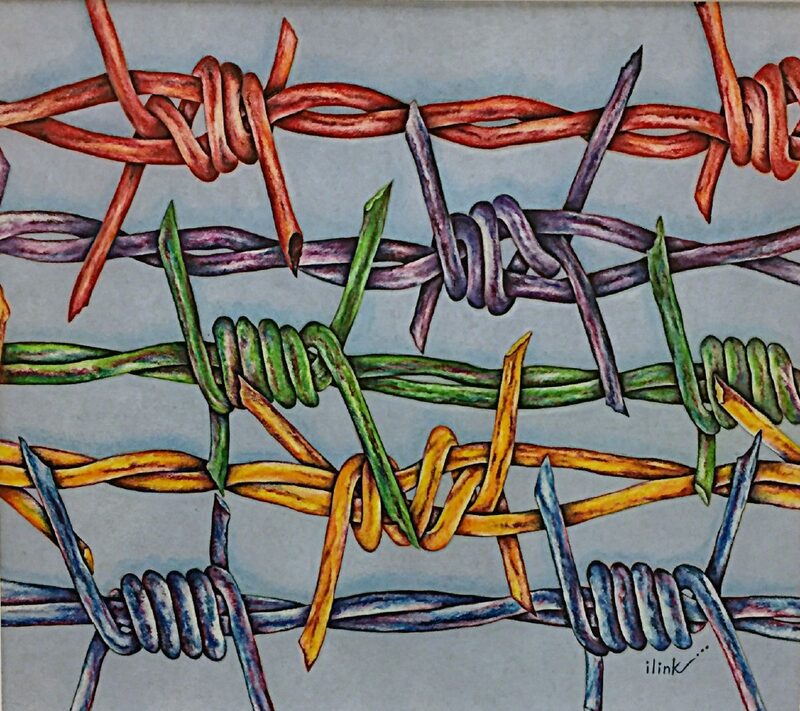 The colored pencil works are warmly engaging, and although the vast majority of work is abstract, there are some representational works of barbed wire imagery that fit right in. 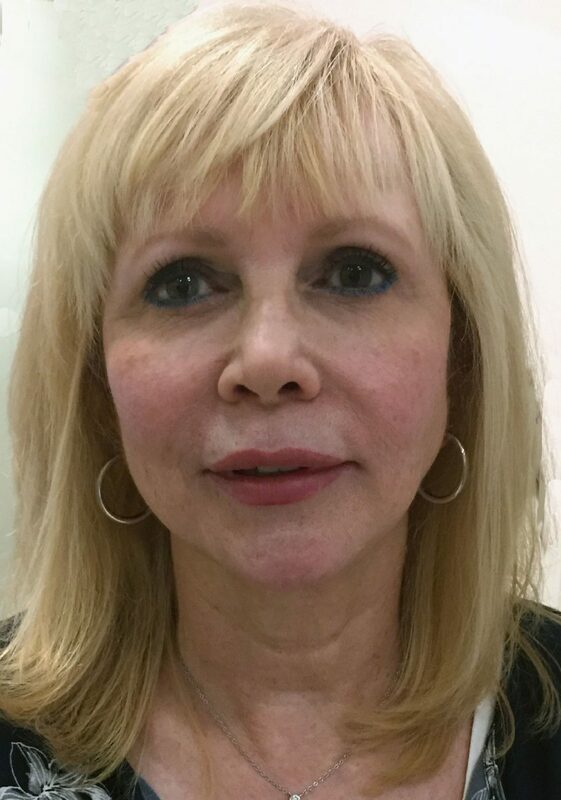 Link says that she started her art career with colored pencil, and her technique with this medium is assured, visually placing these works ambiguously between paintings and drawings. With rich color application, nuanced tonal changes and crisp edges, we assume they are paintings until a glance at the label informs us otherwise. When she decided to take on acrylic painting, the medium changed, but the elements stayed. “Entropy”, a stunning acrylic work is difficult to distinguish from the pencil work, except the scale is much larger. 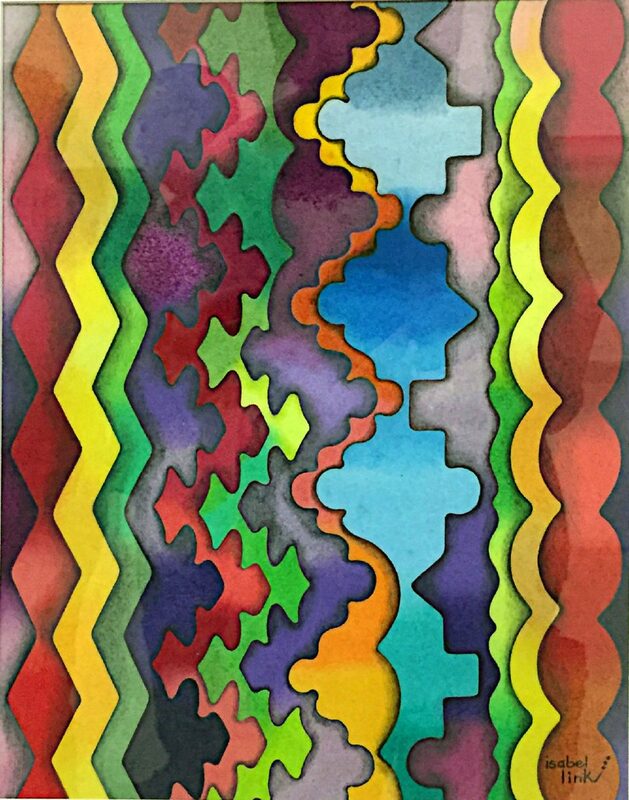 This work expands upon tonal variations, color relationships, optics, and illusion, playing with both color and shape. The outlines act as some sort of artistic membrane that keeps the contents of shapes within their designated boundaries. A group of paintings occupying the south wall embody a looser brush technique and do not fare as well. 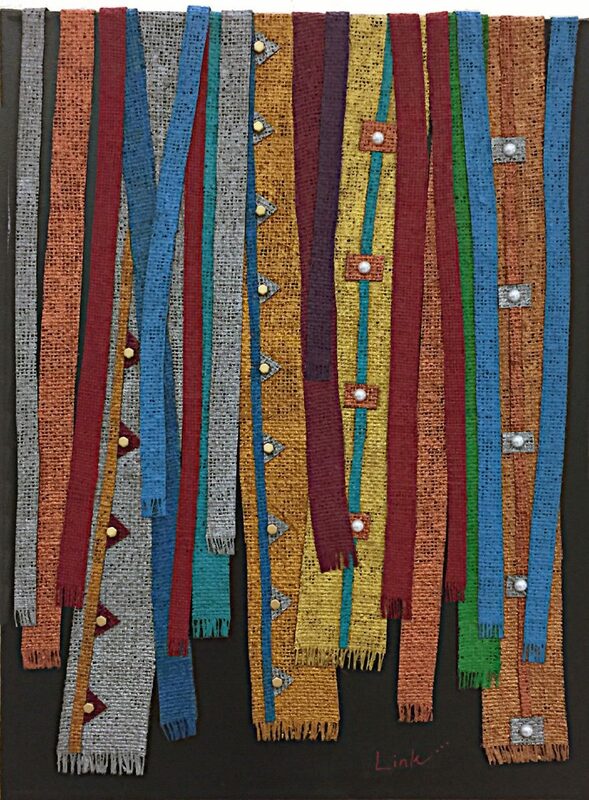 Mixed media works incorporating fabric are seen reflecting both abstract and representational approaches; the bold use of this material breaks from the rest of the exhibit and leaves us feeling as though the works are from another show. The colored pencil images of barbed wire sometimes take on a playful attitude, and other times are more somber. 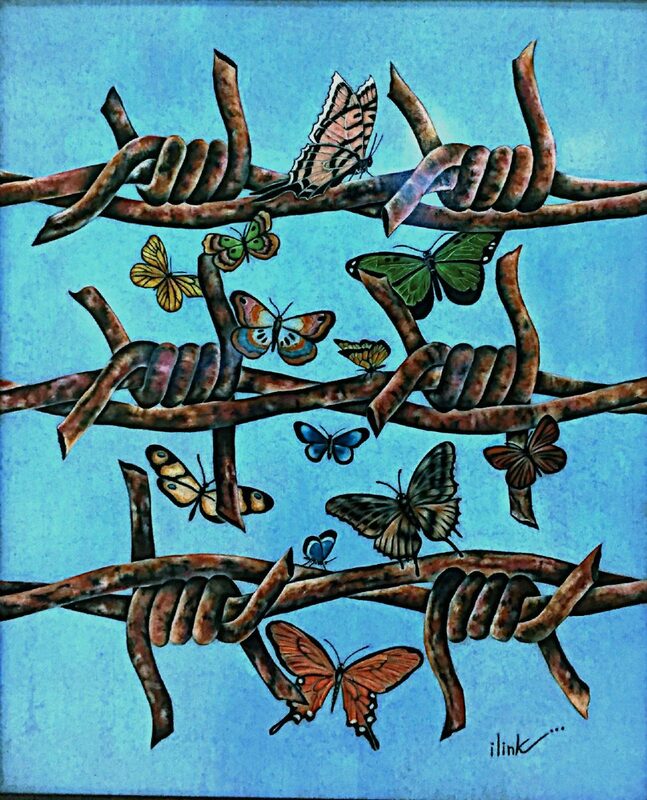 “No Boundaries” shows strands of barbed wire, its open spaces penetrated by butterflies. Link touches lightly on the political conversation with this one; she wonders, is the wire keeping us in or keeping us out? At least the butterflies and other insects can fly through the wire without feeling fenced in. She also uses the barbed wire imagery for another kind of symbolism in a group of three vertical drawings, “New Wire,” “Aging” and “Wired.” Here, she uses the wire to denote aging and suggests the futility of preventing the natural process. However, the overall tone of “Elements and Principles” is playful and very upbeat. Link projects a love of the principles and elements that formulate the essence of Modern art. It’s what she teaches her students and what she believes to be of utmost importance for the creative art process.